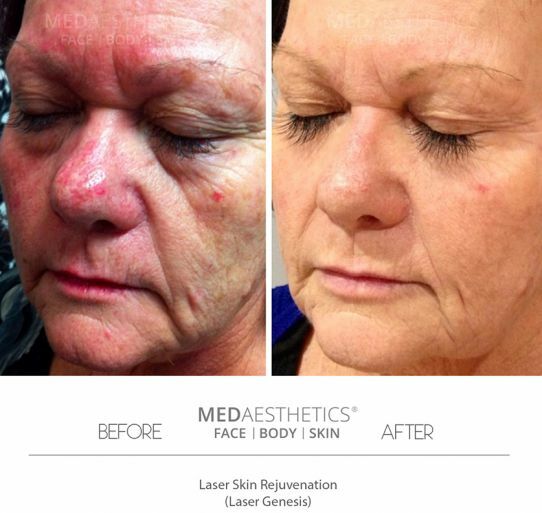 Medaesthetics™ is proud to offer the revolutionary Laser Genesis™ treatment in Perth by world-renowned Laser platform Cutera™. No 1 Lunch Time Procedure. Suitable for all skin types. Laser Genesis is a breakthrough laser treatment that targets the redness and capillaries in the skin. It also simulates the skins natural processes to reverse the signs of aging and sun damage and promote a vibrant, healthy looking complexion. Laser Genesis uses gentle 1064 Long-pulse Nd:YAG laser to selectively target red several skin's disorders associated with facial redness and capillaries. Laser Genesis helps to restore your skin’s youthful glow by improving common concerns like facial redness, brown spots, and fine lines and wrinkles. With quick treatments and no downtime, Laser Genesis can fit into your busy schedule and considered the perfect lunchtime procedure. Laser Genesis is an ideal treatment for the face, neck and decolletage. A series of four to six Laser Genesis treatments are recommended six to eight weeks apart to achieve maximum results. Ongoing maintenance treatments are encouraged as part of our Anti-ageing program to maintain results over time. Our clinicians will discuss a treatment plan during your consultation. You may notice a slight redness which will resolve within a few hours. Patients can apply sunscreen and makeup and return to normal daily activities immediately after the treatment.